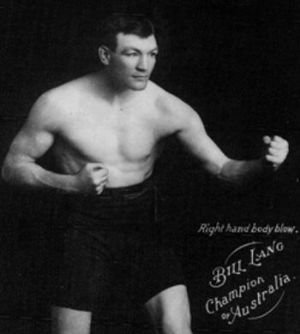 Bill Lang was considered average in boxing skills but carried a hard punch. During his career, he was heavyweight champion of Australia. He scored a knockout win over the well-known champion Bob Fitzsimmons. Lang died at his home in East Saint Kilda Wednesday, Sept.3 1952. He had been in ill health several months. Lang was inducted into the Australian National Boxing Hall of Fame in 2004.